If you follow me on Instagram, you’ve probably seen all of the cupcake bites I’ve been posting lately. Don’t get me wrong, I still love and adore cake pops, but these little treats are so quick to make! But anyone can pour melted chocolate into a mold, right? Impress the pants off of your friends and family by adding some designs on the bottom! For this tutorial, I’m only focusing on how to do the accent designs (that’s why the pictures will just show peanut butter cup shape pieces of chocolate). 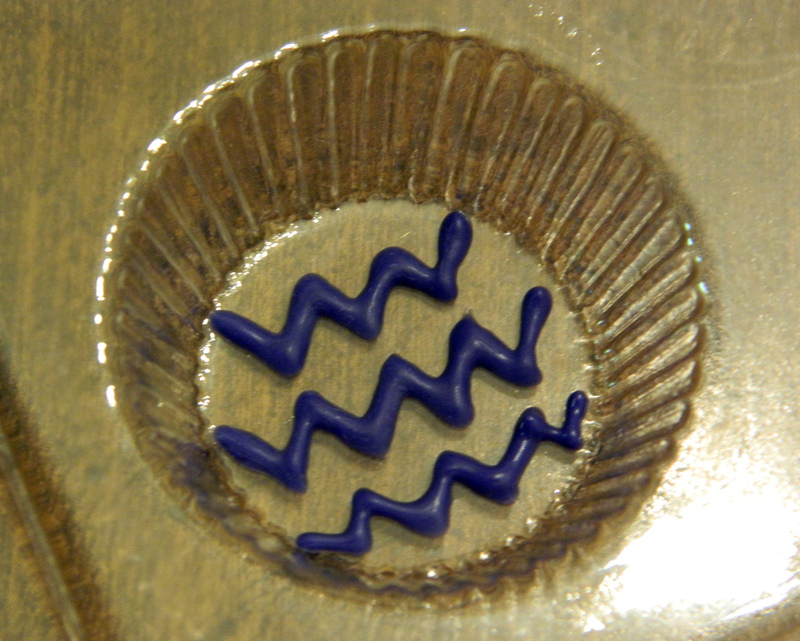 This technique can be easily incorporated into Cookie Bites or Cupcake Pops. To get started, you need two basic pieces of equipment, both costing less than $2 each. Most craft stores sell peanut butter cup mold trays. I prefer the Make’n Mold brand from AC Moore. Wilton’s mold is a wider diameter, and the mold cavities are more shallow, which doesn’t give you much room to hold on to when dipping the top part. Dip your toothpick into the chocolate, and start decorating. 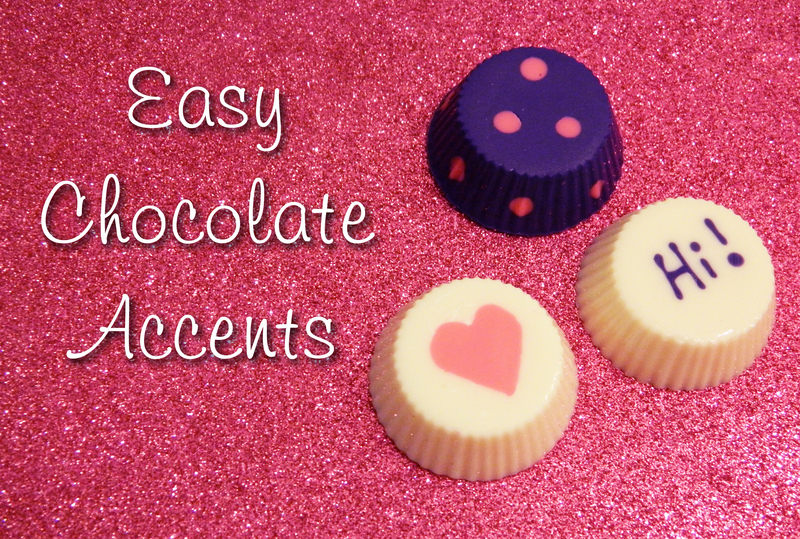 An easy design to try first is polka dots… simply dab the chocolate randomly around the mold. You can also draw basic shapes like a heart. After creating your accent designs, allow the chocolate to harden. To speed up this process, you can place the mold tray in the fridge or freezer for a few minutes. My favorite accent technique is writing little messages. This can be a little challenging because you need to write the words backwards. 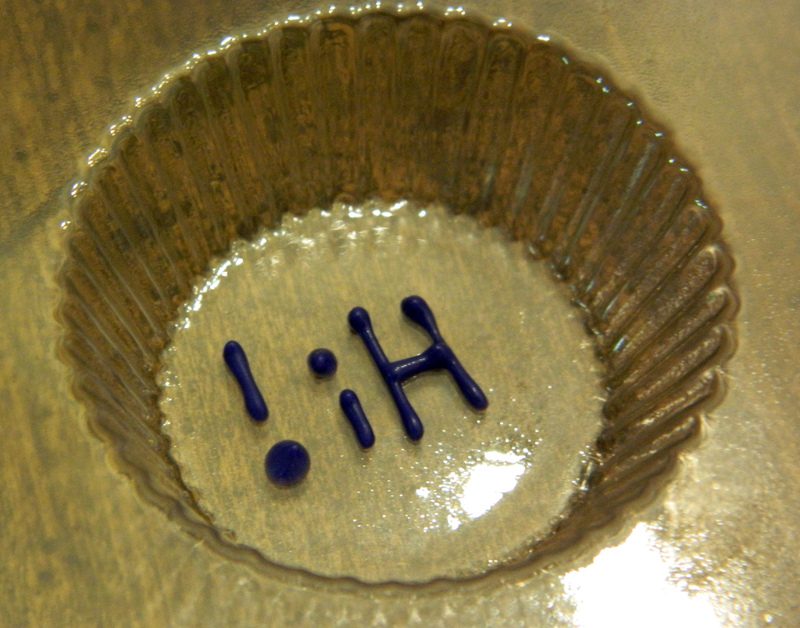 But after I filled it with chocolate and it hardened, it left some tiny gaps in the corners of the “V”. Temperature and consistency of your melted chocolate definitely play a big role here. The cooler your chocolate gets, the thicker it gets. Also, if your chocolate is just thicker in general, try mixing in some oil or paramount crystals to thin it out. 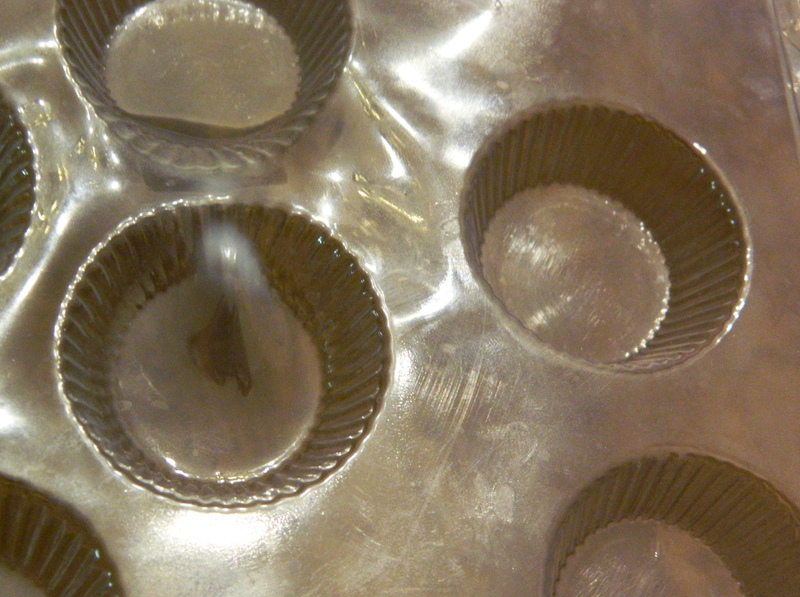 A word of caution when cleaning your peanut butter cup molds… do NOT put them in the dishwasher or clean them with really hot water… the plastic melts, warps and loses its shape. Luke warm water does the trick just fine. I often get asked what molds I use, or how I get my cookie/cake balls to fit just right into the mold cavities… so, I’m going to give you everything I use! (brand new versions of course). I use ghirardelli for truffles and candy quick for dipping and cookie molds. new at this, wilton chocolates, is what i’ve used. I use Wilton because that’s what we have here. I love to use Candiquik for the white chocolate, make n mold for the colors and Wilton for the milk and dark chocolate! I like using guittard chocolate and Merckens. I have a recipe from Weight Watcher that uses a raspberry jam filling – it’s a hit at home and the office!! I’ve been using candy cups since WW calculated the points. The look pretty in gold foil; just a small space to work in. The treat is rich and wonder if the mold would be to big. . . I have only used Wilton for dipping! I reposted and tagged your pic on Instagram! I love using Merkens brand chocolate for my cakepops and treats. I use merckens and never had a problem with it, so I never ventured to try other brands. Posted your picture on instagram. Thanks for sharing tips and for the cool giveaway. I’ve only used Wilton and Make a Mold chocolates to make my cake pops out of those two I definetly prefer Make a Mold! I usually just use Wilton candy melts, but I also love using ghirardelli chocolate chips. I always use Wilton. And I absolutely adore these! Too cute!! I like KC Bakes on facebook. I use either Wilton or ghirardelli chocolate chips. I follow KC Bakes on twitter. I follow KC Bakes on Instagram! I follow KC Bakes on Twitter! I follow KC Bakes on Facebook!! I like KC Bakes on FB and shared it. I follow you on twitter and twittered about the awesome giveaway. Happy Valentine´s day everybody. I use Wilton Candy Melts. It took me a few times to get the perfect melted consistency for my cake pops and candy molds but I prefer Wilton’s to any other brand! I reposted your Instagram picture onto Facebook! I reposted your contest on Facebook! And I use ambrosia almond bark from my local grocery store for most of my cake pop dippin! Merckens is my chocolate of choice … and I love this tutorial! Thanks so much!!! I usually use semi-sweet chocolate chips or Wilton Candy Melts! Already a fan of KC Bakes on FB! I absolutely love Chocoley chocolate for all my cake pops! I’ve tried other brands, but this tastes the best! Shared and Tagged on FB!!! Already a fan on FB!!! already follow you on twitter!!! shared on twitter as well!!! I am already a liker on FaceBook! I like you EVERYWHERE …. I’ve fallen in love with Almond Bark for my white candy coating. I use wilton brand chocolates! I like to use merckens but I don’t have any good stores near me so I end up settling with Wilton a lot. Supposed to say reposted! Dang auto correct! I’ve only used Wilton and Guittard for dipping. Like KC Bakes on Facebook!! I also follow on Instagram!! Just reposted posted on Instagram too! I’ve only used Wilton candy melts. I like to try out different brands, but haven’t yet. HI! Awesome tutorial! 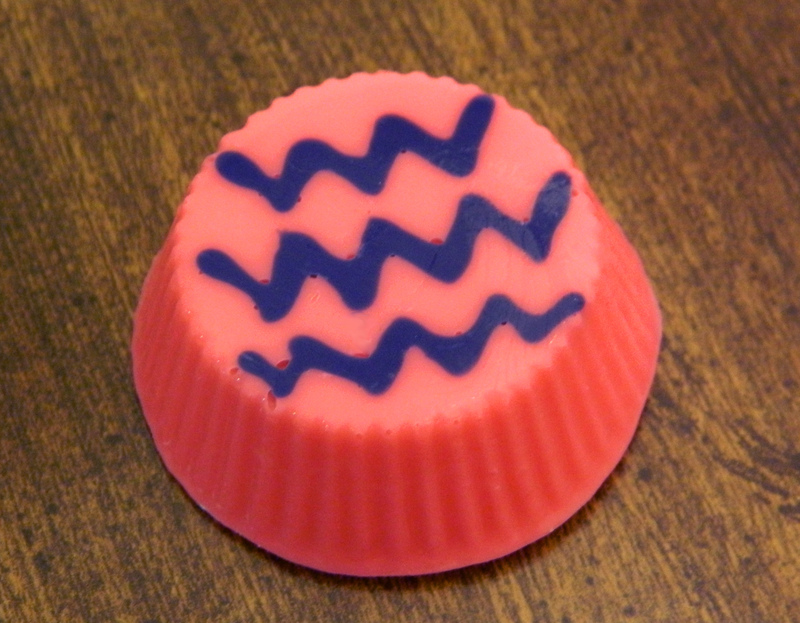 I have always used Wilton Candy melts but recently been trying Make & Mold brand and like it as well! I Like KCBakes on Facebook! And I re-tweeted on Twitter! So many to choose from! For a regular white and brown color/chocolate I use almond bark. Now If I have money too splurge I really like chocoley bada bing bada boom! And for all colors I just recently fell in love won’t Make n’ Mold! These I have named all melt beautifully and I hardly ever have to use anything to thin them out! I just uploaded pic and tagged you on instagram! Just shared giveaway on my Facebook! Just followed you on twitter ! Just shared your pic on twitter and tagged you! I’ve only tried Wilton’s candy melts, so for now those are my favorite. I don’t think I have found a favorite yet! But i use Wilton and ac moore the most… I want to try merkens one day as well ! I use regular chocolate chips! I never have candy melts when I need them! My preferred dipping chocolate is Guittard A’Peels! So smooth and tastes great! I like to use Wilton. So far, I have only used Wilton’s Candy Melts for dipping. I have always just used chocolate coating. I use merckens and an occasional wilton brand if im in a pinch and have run out of M.
I follow kc bakes on facebook! For Cake Pops I use Wilton’s for any chocolate base (I LOVE their dark cocoa), but when I’m catering or doing something extra fancy, I try to buy Merckets ahead of time because their colors are SO bright and their chocolate is excellent. I wish I could use wilton (b/c of the price) but I seem to only be able to use Merkens! My favorite brand of chocolate is Plymouth Pantry’s candy coating for white/brown. For colors, I use Merckens! I follow KC Bakes on Instagram. I use Make N Mold Chocolate for my cake pops and hope to find something better! Ghirardelli has an amazing 2.5 pound bar of melting/dipping chocolate. It comes in white or double chocolate flavors. Everyone loves it and it is ridiculously easy to work with! My favorite so far (as I’m new to cake popping)is Wilton & Candiquik, but I’ve been wanting to try Merckens, I hear a lot of awesome things about it. I use Wilton chocolate only for my cake pops. I add a little canola oil to it to thin it out. 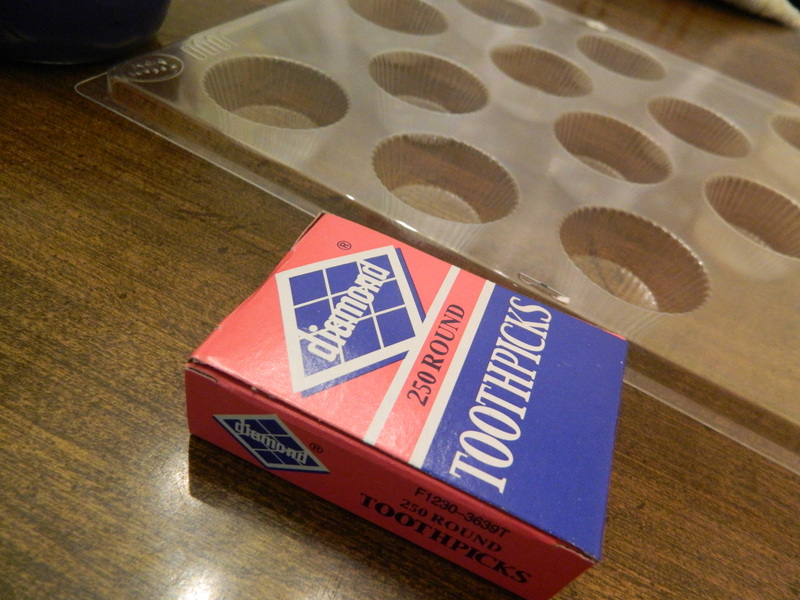 I’ve used both Wilton & Merckens. I like Merckens much better for taste. Pricier though. Whoot hoot! I use Wilton and Merkens Chocolate melts. I have always used Wilton; until I visited my son and went to A.C. Moore I bought an assortment of Make n Mold wafers. they are 2 oz more in a bage and less expensive than wilton. but the melting quality is better esp on the white and colors. I so wish I didn’t have to drive 3 hours to get to an A.C. Moore. Love this idea and can’t wait to try it out. I’m currently using Wilton Candy Melts, but I also have tried using Nestle chocolate chip baking morsels–pretty much any chocolate I can get my hands on. I’ve even used some Scharffen Berger bars that I found at a Big Lots–SO GOOD!! I use Guittard chocolates, and Make n Mold as my second choice for some of the darker colors. Last possible resort is Wilton, but I also and not a fan of Merckens since they don’t have a good shelf life and melt horribly for me. My favorite chocolate to use is Merckens. Make n mold for sure! Used to be obsessed with wilton! I use Wilton’s but have never tried anything else. I haven’t made cake pops yet but I like to bake with Guiradeli. I Liked and follow you on Facebook! I already like you on facebook and twitter. I use Wilton’s because they are sold at the stores nearby. I have never tried another brand. I can only find Wilton locally but I have never tried ordering online or anything. We use Wilton and Merkens! I use the Aldi Brand 85% chocolate bars. Merckens chocolate is the best! My preferred chocolate is a brand called Ambrosia. I know that my local store in texas has it, but I dont’ know where else it is carried. If I need a color, then I use the brand Hobby Lobby carries (but not Wilton). What a cool Idea!!! I love this!!!! you’re followed on Facebook and after this reply, i’m headed to instragram!!! Favorite molds Wilton, I use a lot of their chocolate, so that’s my go to for the molds too!!!! i’ve only used merkin wafers .maybe it’s time to try something different. I use Wilton’s because it’s what’s available locally. I usually use Wilton’s. I want to start trying out Merken’s though. For colors I use Wilton Candy Melts. For white chocolate & chocolate I use Almond Bark. I use candiquik most times. I use ghirardelli for all my chocolate needs. I usually use chocolate chips, but it hasn’t always turned out well. I think I’ll have to follow some of the other suggestions! I use Wilton Candy Melts. Don’t love them but not sure what else to use. I love using Wilton chocolate due to how sturdy and easy to use it is. Have it set up in the fridge or freezer and it has a strong high melting point, perfect for shipping! I shared the give away and tagged you. I like to use the hershey melts or Wilton. I’m a hobby Baker so just starting to experiment on cake pops. Your pb cups look amazing. Must try these! ! I like KC Bakes on Facebook! My preferred brand chocolate to make cake pops is Ghiradelli. So far, I’ve only tried Wilton Candy Melts. I’ve been curious what others like too! Liked KC Bakes on Facebook. my favorite cakepop maker is kc bakes!!! And, now! I follow you on Twitter! Whatever I use it’s great quality chocolate. This post is brilliant and has inspired me to have a go as a spur of the moment thing. I hope you don’t mind but I linked your post to one of my blog posts to share it with others – Check it out: http://katysbakes.wordpress.com/2013/05/20/chocolate-galore/ and see my dodgy first attempts..